Winstock is helping out with the ticket prices! MAY 26-28 ONLY! Buy your Winstock tickets over Memorial Day Weekend and not only will you not have a processing fee, but you will also get your tickets before the price increases to $145 on June 1! Winstock ’18 will take place June 8 & 9 in Winsted, MN, and will feature Miranda Lambert, Dierks Bentley, Billy Currington, Brothers Osborne, Luke Combs, Neal McCoy, LANCO, Sawyer Brown, Walker Hayes, Trick Pony, Jordan Davis, and more! Winstock Country Music Festival Memorial Day weekend promotion valid on tickets purchased Saturday, May 26 – Monday, May 28 only. Promotion not valid on previously purchased tickets. Promotion valid while supplies last. SPONSORED POST: One final reminder that there are only 2 Days Left for DISCOUNTED TICKETS to the St. Mary’s Craft Beer Festival in Winsted. Order online through the afternoon of Friday, Sept., 8th and get General Admission Tickets for $25 ($35 at the Gate).PLEASE PRINT YOUR ORDER EMAIL AND PRESENT AT THE GATE. For a chance to sample beer, wine, & spirits from more than 20 local and national vendors, look no further than the St. Mary’s Craft Beer Festival in Winsted. In addition to the sampling, food will be served at the event including burgers, brats, pork chops, pizza, bottled water, & pop. This 4th annual event will take place Saturday, Sept. 9, 2017 from 2 to 6 p.m. at the Winstock Country Music Festival grounds. Gates will open at 2 p.m.
Tickets can be purchased online at www.stmarysbrewfest.com, St. Mary’s Care Center in Winsted, or at the Blue Note Ballroom in Winsted. Early bird tickets will be $25 through Sept., 8th 2017. At the gate, tickets will be $35 each. Designated driver tickets are available for $10 each, and include a mug and non-alcoholic beverages. The professional baseball careers of Zach Muckenhirn and Tyler Wolfe are well underway, as each was dispatched to their respective minor league teams back in late June. 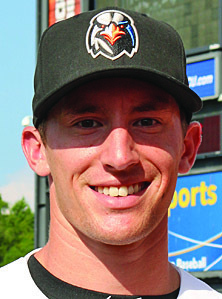 Muckenhirn, a left-handed pitcher who was selected out of the University of North Dakota by Baltimore in the 11th round of the June Amateur Draft, was assigned to the Aberdeen IronBirds. Wolfe, and infielder who was selected out of Kansas State by the Houston Astros in the 39th round, was originally assigned to the Rookie League Greeneville Astros in the Appellation League, and has since been reassigned to the Tri-City ValleyCats. In a fortunate twist of fate for Delano baseball fans, the assignments and one reassignment put both Muckenhirn and Wolfe in the Class A Short Season New York-Penn League, meaning the two will meet on the baseball field as opposing professional ball players. That first meeting comes this week, when Aberdeen hosts Tri-City for a three-game series, Wednesday-through-Friday, Aug. 3-4, on Leidos Field at Ripken Stadium in Aberdeen, MD. Both players hope to get a chance to face each other in one of the games. Muckenhirn looks forward to the novelty of facing Wolfe, and gave his former teammate some bulletin board material to ponder. Fans can listen to the games online at TuneIn Radio, which can be found on MiLB.com. Whether or not Muckenhirn and Wolfe actually meet in a one-on-one showdown remains to be seen, but, if they do, each has shown early in his career that he will be ready. In five games through July 28, Muckenhirn was 3-1 with a 1.38 earned run average in 13 innings. In a combined 25 games with Greeneville (20) and Tri-City (5), Wolfe was batting .270 with 24 hits, including a double, 12 runs batted in, 10 runs and three stolen bases. Wolfe also pitched two scoreless innings at Greeneville. If both remain with their current teams, Muckenhirn and Wolfe will have plenty of time to get to know each other as opponents. Later this month, Tri-City hosts Aberdeen for three games Aug. 17-18 at Joseph L. Bruno Stadium, which sits on the campus of Hudson Valley Community College in Troy, NY. As for playing baseball for a career, Wolfe notes that a player has to love the game, something he, indeed, does. The first two months have been full of adjustments for Wolfe. The adjustments that have to be made come on the field and away from it, according to Muckenhirn. Muckenhirn and Wolfe were the third and fourth Delano players, respectively, ever drafted in baseball. The first was pitcher Tom Traen, who was selected by the Montreal Expos in the 11th round of the 1983 draft, and the second was outfielder Jay Kvasnicka, who was selected by the Minnesota Twins in the eighth round of the 1988 draft. The Delano baseball community was abuzz with excitement June 11, when two of its own were selected in the Major League Baseball Amateur Draft. Baltimore selected 2013 Delano graduate Zach Muckemhirn in the 11th round, and the Houston Astros selected 2012 graduate Tyler Wolfe in the 39th round. Big league dreams do come true. Just ask Zach Muckenhirn and Tyler Wolfe. The two former Delano Tiger teammates saw their dreams come true June 11 during the 2016 Major League Baseball Amateur Draft, when their names were two of the 1,216 selected by major league teams. Muckenhirn, a 2013 graduate of Delano High School, saw his name come off the board first, in the 11th round, 331st overall, when he was selected by the Baltimore Orioles. Thirty-eight rounds and 846 picks after Muckenhirn’s name was pulled off the board, Wolfe, a 2012 Delano graduate, was selected in the 39th round, 1,177th overall, by the Houston Astros. “I’m excited for the two of us to go from the small town of Delano” said Wolfe of he and Muckenhirn, who played on two state tournament teams together at Delano. The community is also excited for Wolfe and Muckenhirn, who grew up playing youth, high school and amateur baseball in Delano. “I thought it was awesome. It’s surreal. Those things don’t ever happen,” said Dan Paulson, Wolfe and Muckenhirn’s high school coach. “It was a big deal to get one guy drafted, like Tom Traen and Jay Kvasnicka, so, to have two in one year in a town our size is cool. Paulson noted that both Wolfe and Muckenhirn will again have orange in their uniforms, and admits to having borrowed Baltimore’s color scheme for his Delano uniforms. As for the draft, Paulson had a hunch both Muckenhirn and Wolfe would have their names called. “At one point in time, after talking to scouts, I knew they were going to get drafted, I just didn’t know when,” the coach said. “When I saw Muck got drafted, I told my wife, ‘Wolfe will be next,’ and then he was. Both players have been bombarded with pride from friends, family members and, even, former opponents. “Everyone seems pretty excited for me. They know this is something I have always wanted. They know how much I put into it,” said Wolfe, who is the son of James and Betsy Wolfe. Muckenhirn seemed more proud of Wolfe than himself. With his selection, Muckenhirn became the first baseball draft pick from Delano since Kvasnicka, a 1985 graduate of Delano, was picked in the eighth round of the 1988 draft by the Minnesota Twins. Traen, a 1979 Delano graduate, was selected in the 11th round of the 1983 draft by the Montreal Expos. Kvasnicka played four seasons of minor league ball in the Twins system, reaching the triple-A level. Traen pitched five seasons of minor league baseball for the Expos and Twins, reaching double-A in 1987. Traen remembers it being a unique when he and Kvasnicka were drafted six drafts apart, and is thrilled to see two Delano Tigers selected in the same draft. Traen’s excitement over seeing two Delano kids selected comes from appreciation for the hard work both put into their games. Wolfe and Muckenhirn are two of three former Wright County Conference players who were selected in this year’s draft. The other is former Waconia pitcher Dalton Sawyer, who was drafted in the ninth round (262nd overall) by the Oakland Athletics. Wolfe and Muckenhirn battled Sawyer often during their high school days. The situations surrounding Muckenhirn and Wolfe entering draft day were completely different, in that Muckenhirn was expecting a phone call from a major league club and Wolfe knew there was a chance that call would not come. “I wasn’t like Muck, so I knew there was a chance I wouldn’t go,” said Wolfe. Wolfe paid attention to the draft mostly to see where his Kansas State teammates were headed. He finally found out he was headed somewhere, too, at around 4:45 p.m., moments before the draft concluded, when Astros scout Jim Stevenson called. Stevenson first noticed Wolfe at Des Moines Area Community College, where he went after Delano, and followed him the for two years at Kansas State. Wolfe’s maturity and ability made him a solid pickup so late in the draft. The Astros were one of two teams who had contacted Wolfe prior to the draft. The other was the Seattle Mariners. All major league eyes were on Muckenhirn, who turned heads with a 1-0 complete-game shutout of then No. 12 USC in his first outing with the University of North Dakota (UND) this past spring. The months, days and even hours leading up to his selection were filled with calls from major league teams and colleges who were interested in Muckenhirn’s left arm. Colleges were after Muckenhirn for his senior year of eligibility. He was available for recruitment because of UND’s decision to dissolve its baseball program after the conclusion of this past season. The leading candidates were all in the SEC. Muckenhirn visited the universities of Kentucky, Alabama, Auburn and Florida in recent weeks, and had offers on the table from 12 of the 16 teams that played in the Super Regionals. Those trips and offers were pushed the the background as the draft neared and Muckenhirn’s name was growing in popularity among major league teams, especially the Tampa Bay Devil Rays and the Orioles. Muckenhirn considered playing his senior year in college, but his heart wanted to become a professional ball player. Anywhere from the seventh round to the 15th round was the expectation from the Muckenhirn clan. When Muckenhirn was taken in the 11th round, he did not know it, as the feed on which he was following the draft went bad. Muckenhirn found out he was drafted via a phone call from his UND coach Jeff Dodson. “Coach Dodson called and told Keith (Muckenhirn’s dad), ‘congratulations,’ and we didn’t know why,” said Kim Muckenhirn. Muckenhirn was the Orioles’ 12th pick out of 41 during the 40-round draft. He became the highest draft pick to ever come out of the UND baseball program. Alex Cooley, who was taken in the 17th round of the 1968 draft by the Oakland A’s previously held the distinction as UND’s highest draft pick for 48 years. Muckenhirn wasted no time in becoming an Oriole. He hopped on the plane to Sarasota, the Orioles spring training home, Tuesday morning, to join his new team. He agreed to a contract and a significantly-larger bonus than Wolfe’s $1,000 late last week. Barring a trade or release, the Orioles will own Muckenhirn’s rights for seven years. Getting paid to play baseball is something Muckenhirn was unable to fathom in the early days following the draft. Two days of working out with the Orioles’ other new pitchers has already convinced Muckenhirn that he belongs. Scott Thomas, the Orioles Midwest scout, believes Muckenhirn has it, hence the draft pick. “I saw Zach for four starts, and he impressed me. I felt he knew how to pitch and could be affective at the next level,” said Thomas, who saw five players he scouted taken by his Orioles. “It’s up to him how far he can take it. I saw something in him that made me follow him the rest of the spring. The atmosphere at Orioles camp, Muckenhirn noted, is like nothing he has ever experienced as a ball player. Wolfe, who just wrapped up his senior season as Kansas State’s shortstop, was drafted as an infielder. After a workout with Twins World Series champion Scott Leius Thursday in Minneapolis, Wolfe flew down to Tennessee Saturday to join the Greeneville Astros, the club’s short-season rookie league team, where his hitting coach will be César Cedeno, who played 17 seasons in the big leagues. The Greeneville Astros begin their season this Thursday, June 23, at home against Johnson City. As a late-round pick, Wolfe realizes his odds of ever making a big league roster are slim. “Everyone I talk to says (major league teams) pay more attention to high round picks, and I get that — it’s a business. If you put money in a kid, you will stick with that kid,” he said. Playing the underdog roll is something Wolfe is used to and excels at. “It’s kind of the same situation I have always been in — go in unnoticed and make a name for myself,” he said. In high school, Wolfe was Delano’s ace pitcher before Muckenhirn, and that’s what Division 1 college programs were recruiting him as. Wolfe, though, wanted to play shortstop, so he turned down those offers and played junior college baseball at Des Moines, where his success with the bat and glove for two seasons earned him a spot at Kansas State. “He was stubborn about it and he worked his tail off and look what happened,” Muckenhirn said of Wolfe’s road to the draft. Taking the junior college route is not a bad way to go, according to Wolfe. The junior college route to the big leagues is not unprecedented. Des Moines Area, itself, has sent four player to the major leagues, including former Twins third baseman Corey Koskie (Minnesota Twins, 26th round, 1994), who played nine seasons and 989 games in the show. The other three are outfielder Scott Schebler (Los Angeles Dodgers, 26th round, 2010), catcher George Williams (Oakland Athletics, 24th round, 1991) and pitcher Paul Wilmet (New York Mets, 1981). Other former junior college players who made the show you may have heard of: Kirby Puckett (Triton College: Twins, first round, 1982), Albert Pujols (Maple Woods Community College: Cardinals, 13th round, 1999), Bryce Harper (College of Southern Nevada: Nationals, first overall, 2010), Jorge Posada (Calhoun Community College: Yankees, 24th round, 1990), Mike Piazza (Miami Dade College: Dodgers, 62nd round, 1988), Curt Schilling (Yavapai College: Red Sox, 2nd round, 1986), and Andy Pettitte (San Jacinto College: Yankees, 22nd round, 1990). As for late-round picks making a name for themselves, Piazza turned a 62nd-round selection by the Dodgers into a hall-of-fame career. According to a BlecherReport.com story following the 2012 draft, 11 percent of players drafted in rounds 11-20 reach the big leagues. The chances of a player drafted after in the 21st round or later drops to 7 percent. Stevenson, the Astros scout who signed Wolfe for $1,000, knows the odds, but he also knows the only way to ever become a big league ball player is to get a chance. Stevenson used the example of shortstop Zach Mayfield, who he signed as an undrafted free agent out of Oklahoma University in 2013. Mayfield began his professional career at Greeneville, where Wolfe did, and is now playing at the triple-A level for the Fresno Grizzlies of the Pacific Coast League. “(Mayfield) is the same player as Wolfe, and he kept hitting at every level,” said Stevenson. Wolfe will be one of the more experienced ball players when he joins the Greeneville team, and will be looked upon as a leader. How far he advances in the system depends on his bat. That bat Wolfe swings hit for a .284 average, three home runs and 37 runs batted in in 57 games for Kansas State this past spring. During his junior season, Wolfe batted .326 in Big 12 games and .287 overall. Wolfe started all 57 games both years he was at Kansas State. Muckenhirn, also had to prove himself as a player, choosing to go to UND, a program that struggled in Division 1, after he was told by others that he was not a Division 1 ball player. Muckenhirn proved himself to Thomas, the Orioles scout, during a game that was not his best. Thomas was in attendance March 11 at Kansas, when Muckenhirn gave up six runs (four earned) on eight hits in 5 2/3 innings in a 7-0 loss to the Jayhawks. The motivation of doubt is what pushed Muckenhirn and Wolfe to become professional baseball players, according to Paulson. They did it without forgetting where they came from, according to Paulson. In the weeks between the conclusions of their college seasons and the draft, both Muckenhirn and Wolfe were both seen where they grew up as ball players, at Delano Municipal Stadium, both humble as ever. Seeing two of their own selected in the same draft proves Paulson and all the coaches in the Delano baseball program are doing something right. Wolfe and Muckenhirn are not the only Delano graduates to sign a professional contract this summer. Former teammate, Trevor Jaunich, is currently pitching independent baseball for the New Hampshire Wild of the Empire League. Another former Delano Tiger, Toby Hanson, should be on the radars of major league scouts in the next few seasons. He will be a junior at the University of Minnesota.